First launched in 1993 by Adobe, the PDF is one of the most widely used veteran pieces of software almost everyone has encountered at some point. Most people use the PDF (Portable Document Format) as it was designed for: to quickly and safely send information that the receiving party can’t change or edit. Of course, with modern PDF editors from Adobe and third-party apps, that’s no longer the case. By becoming editable, PDFs gained renewed value as a flexible communication medium. PDFs are a great way to combine a range of messages and mediums like different fonts, texts, and visuals into one piece of content. Whether it’s an annual report or a scientific research, you convey everything you need in a single document. Over the years, PDF readers and other apps have evolved to give users more control over the humble PDF. The tools like PDFpen, PDF Search, and PDF Squeeze – all available on Setapp – prove that the time of fluid and fully editable PDFs has come. But before we get to those, let’s make sure the basics are covered. There’s no better way to share sensitive data than by using PDF, which gives you a guarantee that nothing will be altered without leaving an electronic footprint. Creating a PDF file is not rocket science with online converters. Whether you are using Pages in iWorks or MS Word for Mac, the Export as PDF option will quickly convert anything you are working on into a PDF. In Pages, this option is under File > Export To > PDF. 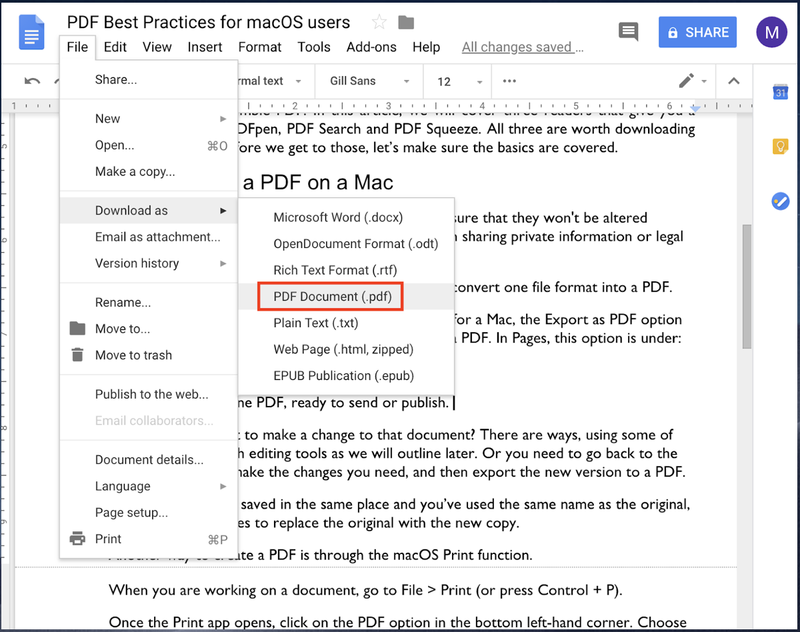 If you prefer to work with Google Docs, Spreadsheets, or any other cloud service, here’s the easy way to grab your doc: File > Download as > PDF Documents (.pdf). But imagine your frustration when you spot a typo or a major mistake in the exported doc. To fix the problem, you can use one of the following: 1) go back to the original document, make the changes you need, and then export the new version of PDF; 2) try a powerful PDF editor. If you go for the first option, remember to click yes to replace the original with the new copy in case the new version is saved to the same place. 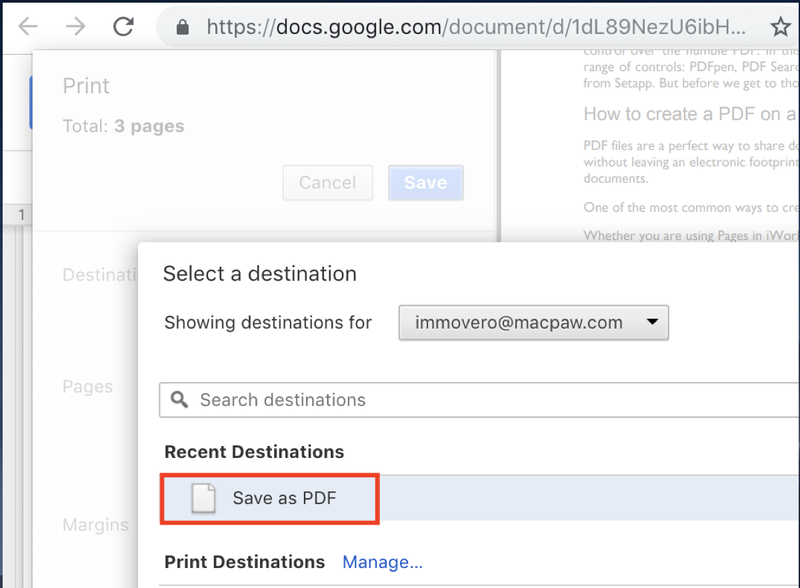 Another way to create a PDF on Mac is through the Print function. When you’re ready to export, go to File > Print (or press Control + P) to open the Print app. Click on the PDF option in the bottom left corner. Finally, select Save as PDF, name the doc, and choose storage location on your Mac. Whether it’s a document you’ve downloaded from the Internet, or you’ve been sent one as an attachment in an email or social media message, opening a PDF is a no-brainer. Simply click download, and then your Mac will give you the option to Open or Save. Click Open and you’ll see the document in Preview, the default macOS PDF reader. Now when we’ve covered the basics, let’s look at the best ways to edit, reduce, and search a PDF using AI-technology. The reason why PDF is the format many users love to hate is because it seems intractable. An editing tool for Mac called PDFpen was built to change that stereotype forever. The macOS app comes with OCR (Optical Character Recognition) that scans a PDF, turning it into editable text. You can easily add content, correct mistakes, create and save signatures as well as redact sensitive information. On top of that, the tool allows you to drag-and-drop thumbnails to rearrange pages or merge multiple PDFs. PDFpen comes with a whole range of features that many can’t live without. Once you install the app and start using it, you’re in for a seamless PDF editing experience. PDF has a basic search function, which, sometimes, is all you need. But when you’ve got a lot of information to search through, or you know some words could be misspelled, you need more advanced functionality. You can bulk-search your docs using PDF Search, rank results, and convert other documents into PDFs painlessly. The app can deep dive through hundreds of pages of documents in a flash, finding every possible combination of your search term or a specific sequence. With AI-assisted search, PDF Search automatically corrects mistyped keywords and performs parallel searches for related items by leveraging context-dependent information that most basic search apps completely miss. Anyone who's ever published PDFs knows that when you combine text with graphics and pictures, you can end up with files that are too large to download. The last thing you want is to publish or send an important document only to see it won’t download. With PDF Squeezer, the problem doesn’t exist – the app compresses any PDF files lightning fast. Take any large doc, drop it into the app and get a PDF that’s much smaller. Nice and simple. PDFs have been a carved-in-stone part of how we communicate and share information for decades. With newly evolving tools for PDF manipulations, the situation is changing pretty fast, though. Grab the right one and make your PDFs as editable as any word processing document.